1. I arrived at work, ready for a very busy day of lab stuff, only to find that the cells I was going to use were all growing beasties that should not have been there. Break out the bleach, rejigger the experimental schedule, and grumble. 2. I have, apparently, come down with the same beasties that my cells have. Cue runny nose, headache, scratchy throat and general brain fuzzies*. So off I go to procure pharmaceutical aids. 3. Ahhh...there isn't really a number 3. I think numbers 1 and 2 have taken care of it. So now I am huddled in front of the computer, trying to get things taken care of for the Yarn in the City Road Trip, and wishing I could consume Lemsip more often then every four hours. Thankfully, there is a steaming hot toddy in my very near future, plus huddling under the covers with my latest, very special design project. On the left is the start of the sock on Saturday, on the right is the new sock and the old one that I'm reproducing. Suffice to say that this design has historical, genealogical and medical interest, and I'm looking forward to getting it in a final form** for you all. * We will ignore the fact that said brain fuzz might also be a general state of being in my world. ** Top-down and toe-up FTW y'all. For a long time, I've been resistent to trying Koigu. All I knew is that it came in lots of gorgeous colors but was a little outside my comfort zone in terms of price. Coming from a staunch New England Puritan upbringing, I somehow could never bring myself to spend $12-14 on one skein of yarn. And what would I make from it anyway? 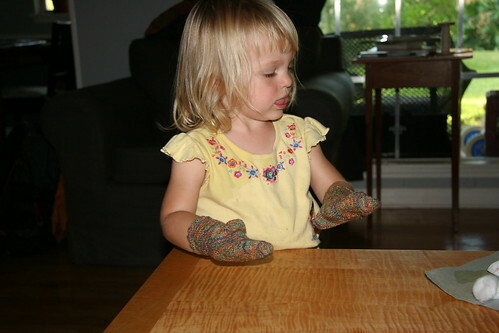 Then I started reading about how wonderful it was to knit with, and how soft, and saw some pictures of how it looked when knitted up. I started thinking that maybe getting just a little bit would be ok, just to try out. in town and dropped about $300 in 45 minutes (Hey, they were having a sale. I got a lot of stuff). Included in this great haul were two skeins of Koigu for a pair of socks. 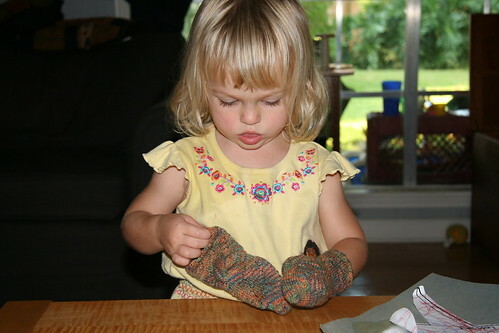 They sat in the stash for about five months before I started thinking about what pattern to use. These socks were definitely going to be for me, since I'd been knitting my husband a pair of socks for what felt like forever. I looked around a bit and came across the pattern for Wyvern socks - I've always had a soft spot for dragons, and these looked like dragon scales to me, so off we went. Modifications: I added some additional space in the heel area by increasing 2 stitches every other row for the last inch or so before the heel. 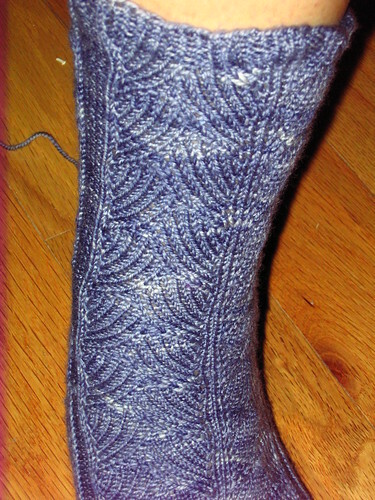 Did the short row heel, and then decreased the extra stitches at each side of the leg until I was back to the normal stitch count. I did these in the unribbed version, since my size 10 clodhoppers are neither narrow nor high arched. 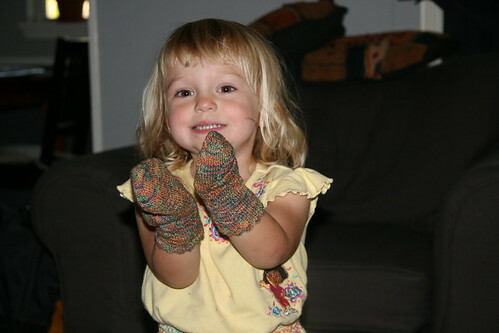 and you can see that I have not yet cut the yarn and woven in the ends. Sigh...it's the finishing that gets me every time. One of the things I like best about these socks is that they're knit from the toe-up, so you can use as much of the yarn as possible. These are a bit of a tight fit to put on, even with the extra space towards the heel, but nice and comfy once they're on. And so pretty. 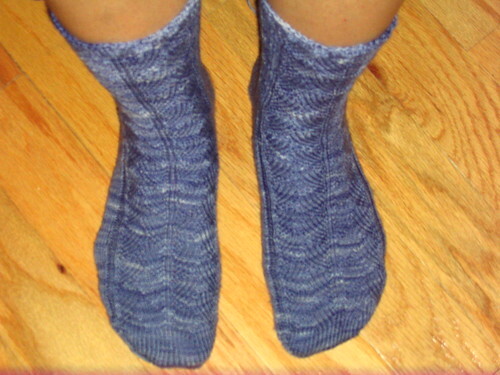 I suspect, from what I've heard about using Koigu for socks, that they won't wear well, but so be it. Most of my enjoyment in knitting comes from the process, not the end result, so I'll be happy to make more when these are done. 1. Commuting socks – I ride the bus to work, which in Houston means 1 hr+ from where I live on the west side of town to downtown where I work. 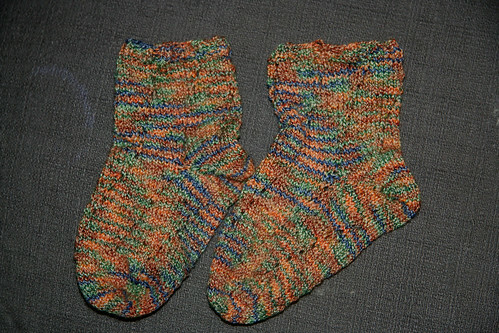 Socks are always in progress – this pair were supposed to be a present for my Dad for his birthday. His birthday was at the end of March. I used to have a really hard time remembering the exact date of his birthday (the 21st or the 22nd? ), but now I have no problems because his birthday is the day before my oldest daughter’s birthday. Problem solved. 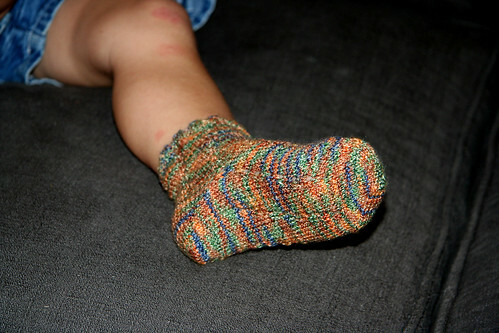 Anyway, his birthday was at the end of March, and I cast on for his birthday socks a week and a half ago. Oooops! In my own defense, I was working on a pair of birthday socks for my husband in March, and his birthday is earlier in the month then Dad’s, so…these are the current bus socks: Trekking XXL with Knitpicks Essential on the heels and toes to maximize the stripy goodness. 2) Baby pants from Alison Hansel’s pattern. in Knitpicks Shine Sport, which I’ve never used before – it’s very soft and nice to knit with. Plus machine-washable which is a necessity with anything going within a 30 foot radius of a baby. Or at least my baby. I’m trying to finish these very soon so they still fit her. You may wonder why a baby would need knit pants in Texas in June*, but her classroom at daycare is approximately the temperature of a meat locker, so these seem like a good idea. Another knit item for said baby: EZ’s baby surprise jacket in the wrap-around, V-neck version from Spring/Summer 2007 Vogue Knitting. This poor sweater has been languishing for at least a month and a half with one shoulder grafted. All I have left to do is knit the cuffs and (maybe) do some edging. And find buttons. Not so hard, right? I predict this sweater will be finished when its intended recipient is potty-training. Oh well. So that’s the current OTN list. Want to take any bets on how long it takes to get them finished? Also: please note the attractive backdrop for the first two pictures is the ongoing kitchen renovation. Not the most lovely of photo ops, but so be it - it was handy. *My husband rolls his eyes and says “Knit pants???!! !” in a totally scandalized voice whenever he sees them. Whatever dude, they’re cute.